The Reverse Diet is the creation of Tricia Cunningham who was able to lose 172 pounds in 9 months simply by switching dinner for breakfast and breakfast for dinner. She joined forces with nutritionist Heidi Skolnik to detail a lifestyle that involves having a larger meal at the beginning of the day and then smaller meals and snacks as needed in the later part of the day. Cunningham claims that by switching the bulk of your calories to breakfast this will significantly change the way that your body uses calories. Breakfast is followed by an entire day where you are involved in physical activity, which will allow those calories to be burned whereas dinner is generally followed by a long period of inactivity, which will promote calorie storage. Dieters are advised to never skip breakfast and to eat a medium sized lunch and a small dinner and to only eat when hungry (apart from the mandatory breakfast). If feeling full before the end of the meal the leftovers should be saved to snack on for later. All vegetables are allowed including potatoes. Recommended fruits include berries, peaches, pineapple, apples, grapes and plums. Tofu, eggs, fish, chicken, turkey. 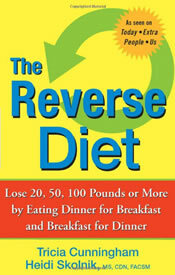 The Reverse Diet retails at $14.95. Eating breakfast is associated with a greater likelihood of weight loss as well as many other health improvements. Eating protein and vegetables for the first meal of the day will reduce appetite and cravings for the rest of the day. A light evening meal may promote better sleep especially for those with digestive problems. Many people do not have a large appetite or the time to prepare and eat a large meal in the morning. May be disruptive to family life, as it will require a change in the entire approach to regular meals. Extremely difficult to eat dinner out on a social basis. Makes claims that are not confirmed by scientific research. Overemphasizes tofu in the diet recommending up to four servings daily, an amount that could potentially lead to nutrient imbalances. Recommends margarine, which is a source of extremely unhealthy trans fats. The Reverse Diet’s claims regarding any unique effect on metabolism by altering the timing of calorie intake are clearly not supported in the scientific research. However, eating a high protein breakfast is associated with a greater weight loss success as it tends to reduce the likelihood of overeating later in the day and this is the strength of this plan. If dieters are able to lose weight on this plan it will be due to a reduced appetite and other lifestyle changes that may result in a subsequent reduction of calories and thus weight loss. For many dieters The Reverse Diet system of eating will not be practical as it is too disruptive for normal social activities and family life. It seems possible that simply following the practice of eating a nutritious protein rich breakfast daily rather than overhauling the entire eating pattern would provide most of the advantages of this program. This works! I lost over 7lbs in 6 days! I am just sticking to whole foods though. Nothing special…like tofu. For example Breakfast:Baken Chix Breast with large helping of Broc. & Cheese. Lunch:Medium salad with regular ranch dressing. Dinner:Small veggie omlette or bacon and two eggs. I have energy, that I haven’t had in a long time. Thanks Tricia, thats all I can say.. and oh yeah to everyone else REVERSE WITHOUT DELAY! I see the point of making breakfast the largest meal of the day. How about a large bowl of oatmeal with a two egg veggie omlett and whole wheat toast? That can be followed up by a smaller lunch and if you have a dinner engagement, just be sensible. Eat like a king at breakfast, a lord at lunch, and a peasant at dinner. I was told this a while ago, and i guess it works on this principle. This style of diet is well documented for the simple reason that it is the cultural choice of eating in the Russian culture. (A culture made up largely of healthier people than the US) An old Russian proverb says: “Breakfast is for family, lunch is for your friends, and dinner is for your enemy” Having spent two weeks emersed in the culture with a Russian host family, I can say honestly that I lost weight while I was there, but always felt full. On an interesting side note: the russian old culture views “yawning” as a hunger reflex more so than a tiredness one. I can also say that I have bean convinced of the truth of that belief. i don’t think this diet has any basis of fact you could do the same thing by just switching the proportions of nutrients not he foods so if you want to try it try it but i doubt it will work. ( Please note i have not tried it my self.